Planit! for Photographers | Plan the Shot! This is the only planning app you need for landscape photography. Everything you need for your landscape photography planning, from golden hour, to blue hour, to milky way, to star-trails, to timelapse, to eclipses, to seascape, and more. Everything, I mean everything. The app that you can depend because all information provided in the app are accurate as long as you use it correctly. The position of celestial object is accurate up to 0.1°. Just imagine you are using the app is your camera, you can place it at anywhere on the earth, set the time to anytime in the past or future, and see the corresponding information while you are still at home. The Planit! app is just like a virtual camera. Instead of actually going to a location to place your real camera, you can place the camera pin on the map to simulate going to that location. You can add markers to the map to create your own scene and visualize it in the virtual viewfinders. 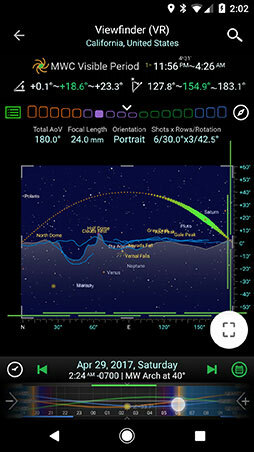 You can also adjust the time slider to change to any time in the past or in the future to see the Sun, the Moon, the stars, or the Milky Way moving over the map or in the viewfinder. Camera location, main subject, camera azimuth and elevation angle, focal length, aperture, depth of field, hyperfocal distance, panorama. 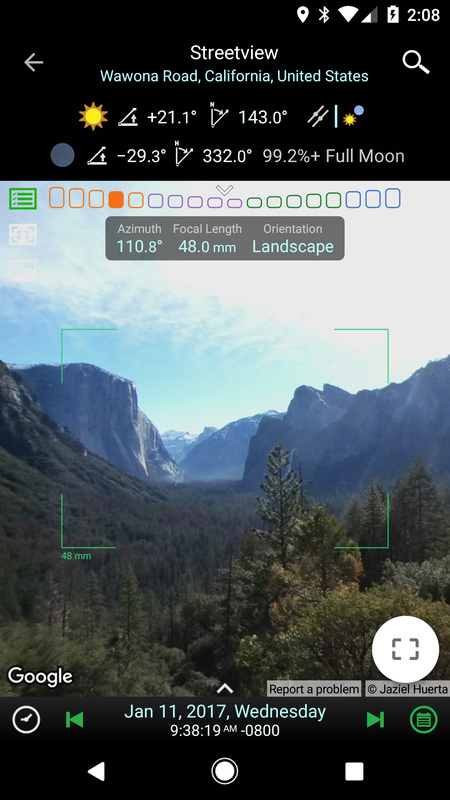 You can set pretty much every settings about your camera virtually in this app. By adding markers to the map, you can simulate any compositions in your mind. Creativity is the only limitation. This is what makes the Planit! powerful because everything is in your own hands. Nothing is more familiar to a photographer than the camera's viewfinder. Now you can use the Planit! to see a simulated viewfinder. 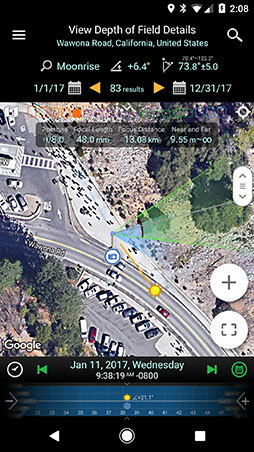 It can be viewfinder of VR, AR, Picture or Streetview with ephemeris overlays. Powered by Google Search, you can search many interesting locations on the earth. The same search text box accepts coordinates as well. You can save the locations as marker files and share them with friends. Over 100 features available in this app. Check out this overview graph below. It is a huge image file. You can right click to download it and zoom in to see it on your computer. Here are some video tutorials. We will create more in the future. If you prefer to read help files instead of watching the video tutorials, here are nine user guides in PDF format. Please find some screenshots in the app. A must have app for anyone interested in landscape photography and for astrophotographers. Shows the position and height of all solar system objects, stars, milkyway centre relative to the local surrounding areas. 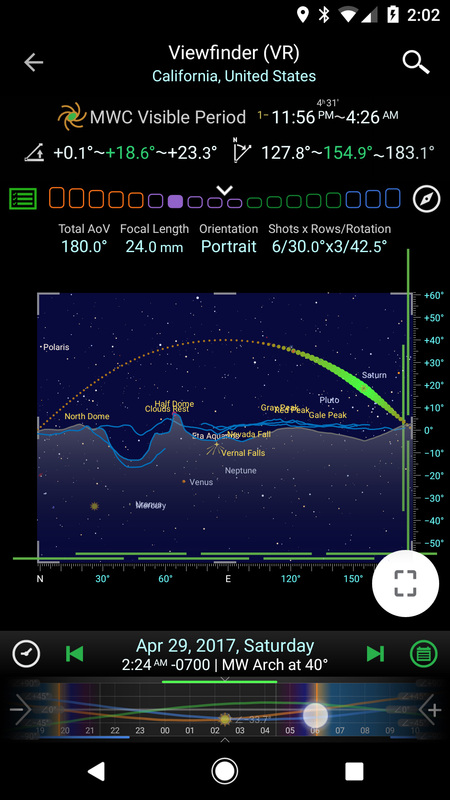 Find a nearby dark site using the light pollution layer, and even simulate the scene through the viewfinder at a future date and time. What shutter speed do I need to prevent star trails? How long an exposure to get complete star trails? 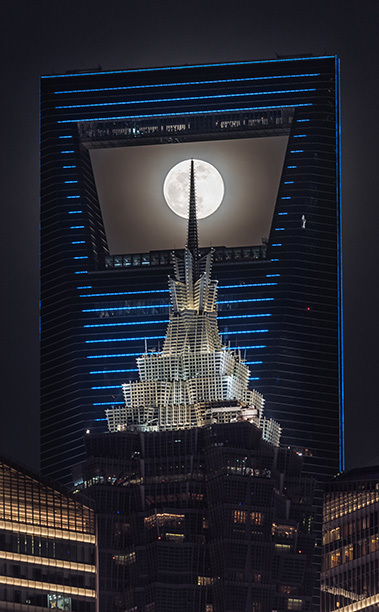 Will the moon appear behind that hill? All of this is answered! I wish I'd found this years ago! Amazing - Dec 2016 Update is Phenomenal! Wow, it looks like it does everything! 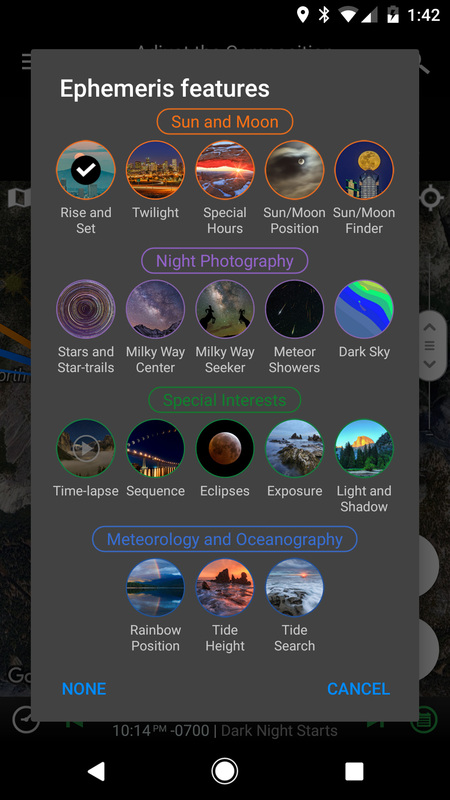 How will reality match up to the plan remains to be seen as I just installed the app but I've already got several shooting sessions planned out for upcoming vacations thanks to this app - Milky way, sunrise/sunset, etc. Very very handy. Takes all of the guesswork out of positioning, timing, useful scenario based camera settings, etc. Be sure to watch YouTube tutorials, then it will all click. This is the BEST. 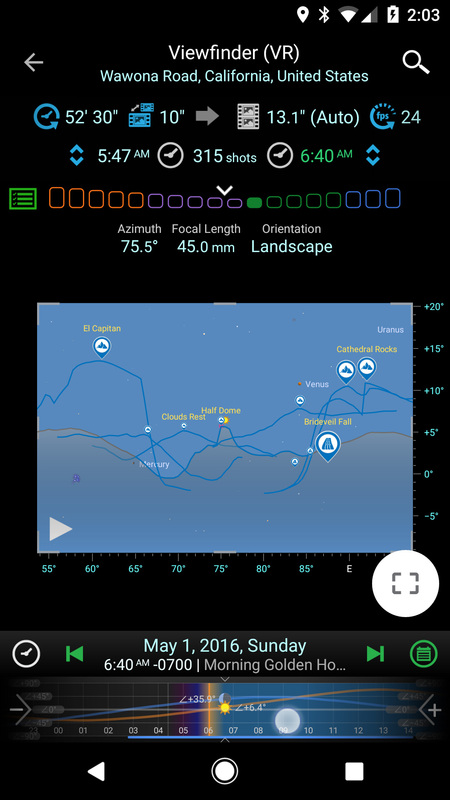 I specialized in moon alignment with landmark and this is the only app that helps me confidently plan ahead, accurately pinpoint the target and achieve the exact view I want to shoot every month without fail. Great app, makes me want to do more photography So many good features, hard to go over one by one. The easy way of sliding the time and seeing the view changes is the most impressive. It even adjusts the view based on lense focal length. I heard from a friend about this app, and it replaces all the silly small sunrise sunset, tide apps I used before. This is an all in one app. Great work, worth much more than the price charged. Absolutely brilliant! Over the years I've accumulated several different apps with the aims of aiding my landscape photography. I didn't think it was even possible to bring them all together but this app without doubt has managed and exceeded my expectations by far. Literally everything is there you could hope for. It's intuitive and all put together perfectly, it also has great explanations and advice within the app for clarification. It's a properly put together app and beyond any doubt definitely worth the price. I'm amazed! 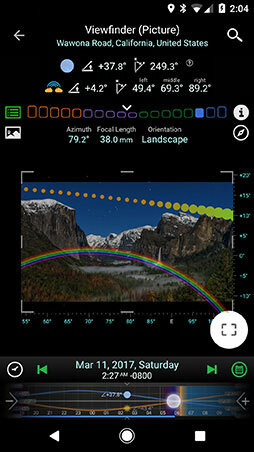 KILLER APP for landscape photography. Good planning is half of landscape photography. And above all, nightscape shots. I usually find myself using some combinations of dark site map + moon phase calendar + panoramio. You get the idea. It can be time consuming and hard to keep track of so many balls juggled in the air. Planit! not only gives you those functions, but also visualizes it, which is a HUGE DEAL! Planning and exercising the shots are never this easy by playing with an interactive view. What you see is what you will get. Nailed it! Why didn't I get this app earlier! Such a good app! So much info for planning a shot. Wish I'd got it last week. Went out at night thinking a MW shot.... Looked up, full moon, went to the place I had in mind, MW was behind me. Failed, and disappointed. Now I'm never going unplanned again. Best photo app on the market!! I love doing night photography specifically photos of the milky way and this app is 2nd to none. On top of that the developer is one of the nicest and most helpful people I've come across. He helped me get to know the app better and now this is the only app I use for my photography. Top notch 10 stars would be given if I could. Help him out and buy the paid version it's worth it! Innovative and stunning I'm yet to get out and take real photos as a result of using this app, but the possibilities it is enabling are amazing. This app does so much. The potential is limitless. It works beautifully on my phone and the video tutorials have been very helpful. A Must Have for any Photographer!! If you are a photographer, do yourself a favor and buy this app ASAP. 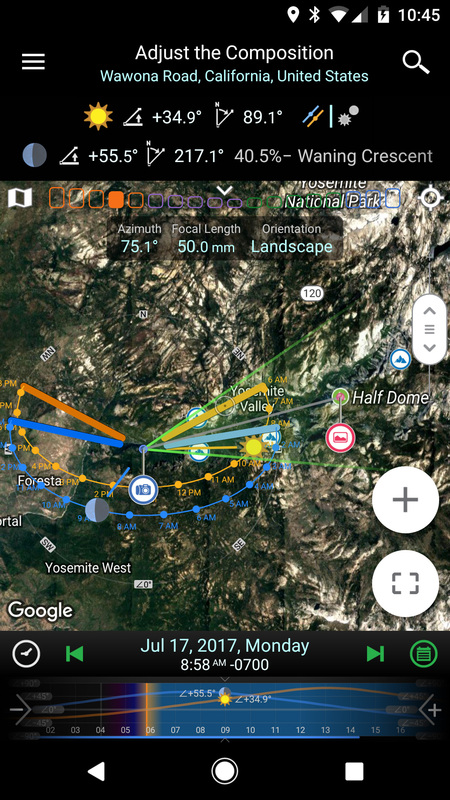 This app is a must have, and is hands down better than the other ephemeris apps I've used. Bortle Dark Sky info, Sun, Moon, and the Milky Way azimuth, angle, rise and set times. The ability to save your photography plan for later viewing. This app has it all. My only regret is not buying this sooner!!! Do yourself a favor and click the "buy" button right now!! Exceptional tool for archaeoastronomy! After only a day of use, I can see this is going to be a very useful planning tool. I have watched the tutorial and am still learning the interfaces. Certainly more complex than TPE and a bit like a Swiss Army Knife as far as flexibility and applicability to a host of activities. I do archaeoastronomy documentation in addition to photography and have found the VR view a very useful new tool in my kit. Update: Through experimentation, I discovered the skyline horizon is very dependent on where the scene icon is placed. This makes perfect sense in complex terrain with many layers of mountain ridges. The elevation profile determined from Google Map is analogous to an x-ray slice of a cat scan. After finding the true obstructing ridgeline (8 km vs 10 km distant), Planit! was spot on in comparison to timing and perspective in reference photos I previously took from the same location. This is an exceptional product which I highly recommend. Far exceeds expectations I live in a country with extreme changes in available sunlight, and varying even further in fjords and yet more in the north. In these circumstances it is of extreme importance to know exactly at what time the sun is at a given location, this is where the Planit! comes in. So far the use has been straightforward and the accuracy, usability and applicability has proven to be far deeper than I had ever imagined. So much so that this is the first, and only, rated review I have given. What's main difference between the Planit! and all other similar apps? Virtual Reality Viewfinder or VR in short is one of the main features that none of other apps have. It is much more accurate than the Augmented Reality. Many users switched to the Planit! because other apps are not accurate enough. Is Internet required to use the Planit! All ephemeris calculations don't need Internet. The Internet is only required to download the map. If you anticipate going offline, you can browse the map for that region so that the map will be cached. You may also download the offline elevation data for the region following the instructions on the user guide. Does the Planit! work for any locations on the Earth? Yes, the Planit! works anywhere on the Earth. You can set the camera pin to a place to see ephemeris information for that location. You can plan for any locations even at home. 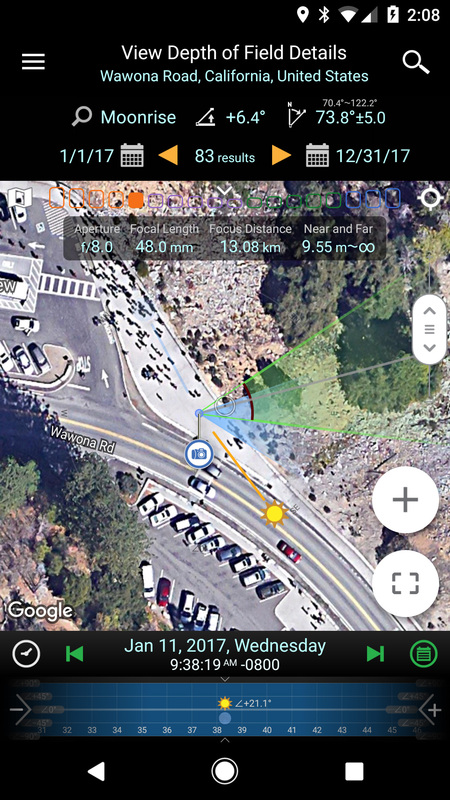 That's why it is called Planit - to plan the shot for anywhere and at anytime. Can I use the Planit! on site? While the main purpose of the Planit! is to plan beforehand, you can use it on site as well to check the plan or adjust the plan based on what you actually see. The AR feature can also be used on site. There are also many tools such as exposure and nd calculator, DoF, panorama calculator etc. that can be used on site. How accurate is the Planit? It depends. The celestial object position (azimuth and elevation angle) is accurate up to 0.1°. The elevation provided by Google is up to 30m resolution in U.S. and 90m outside U.S. There are also other factors that could affect the accuracy of the planning, such as the map accuracy which could affect the placement of the markers. Can the Planit! run on computers? 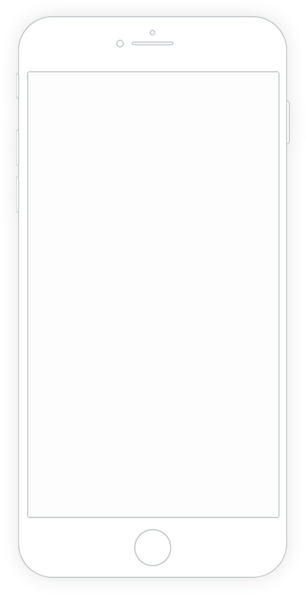 The app supports iOS and Android natively. If you need a big screen, you can use iPad or Android Tablets. You can also use a mirror software such as Vysor to mirror an Android screen to a computer so that you can a big screen to work on. A 3rd alternative is to use an Android emulators such as Bluestacks to run the Android version of the app. Does the Planit! support offline map? Not at the moment, but that's something we plan to support in the future. Located in the beautiful San Diego, we are a group of enthusiastic landscape photographers and professional app developers along with many supportive users around the world. We are determined to bring the best app for our fellow landscape photographers. @ 2017 Planit Photo Inc. all right reserved.